Courtallam (or Kutralam), situated in the Tirunelveli district of Tamil Nadu, is well known for its 10 beautiful waterfalls. 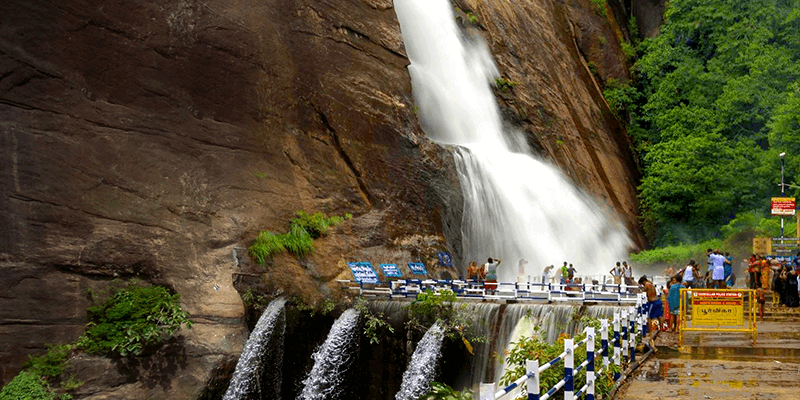 Nicknamed as “Spa of South”, Courtallam is situated amidst the picturesque settings of the Western Ghats. It is also the originating point of many famous rivers such as Thamirabarani, Manimuthar, Pachaiyar and Chittar. According to the Hindu mythology, Kutralam of the yesteryear had a deep connection with sage Agasthya. This small town buzzes with tourists during the monsoons, and adds to the diverse charms of Tamil Nadu tourism. The best time to visit Courtallam or the Kutralam season for tourists would be between July and September. 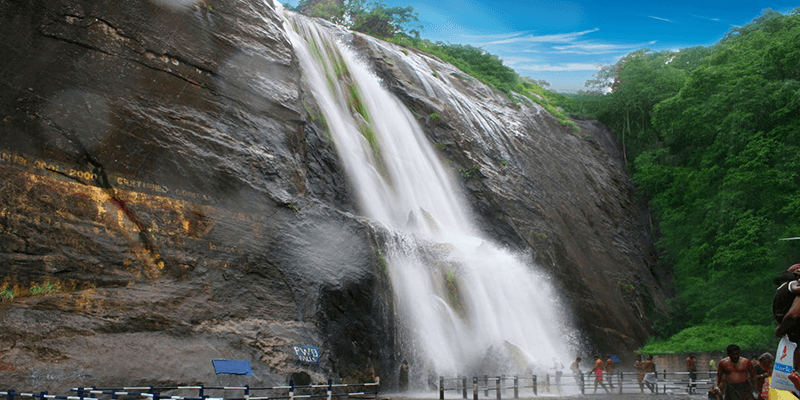 A tour to Courtallam typically revolves around a list of exciting activities centering its waterfalls. With that thought in mind, we will take a deep plunge into some activities you can enjoy in while at Courtallam. 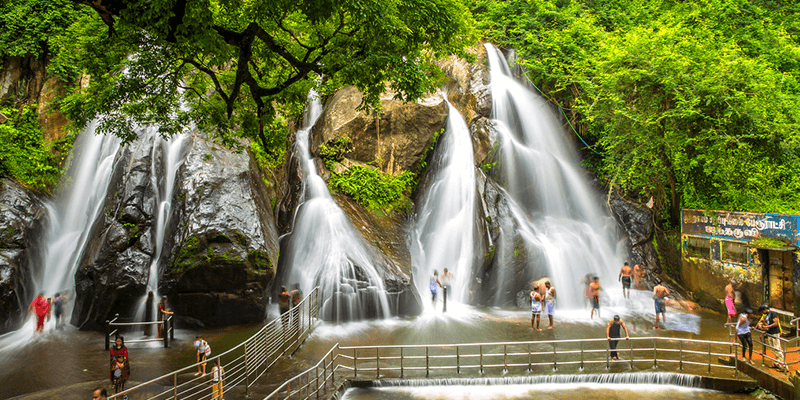 If you are facing digestive or urinary problems, then your cure lies in taking a plunge at the Peraruvi falls. This waterfall has great medicinal value and bathing here relives you of the aforementioned health conditions. Now coming to the beauty of this waterfall, the water falls from a height of 60 meters creating a 19 meters deep natural crater. The repeated pounding of water has created a hollow space, which are presently used for bathing. There is a bridge under the hollow, where the tourists can stand and take their bath. This hollow also allows the tourists to hide underneath the waterfall if they find the water force too strong for their liking. There are Shiva Lingams and motifs of other gods crafted on the rocks nearby, giving a divine feeling to the waterfall. Trivia: A lot of research has been conducted on the medicinal value of the water here, and it has always got positive results. Tip: About 300 people can take a bath under this waterfall at a single time, standing on the specially created bridge. Souvenir: You would typically find many people filling their pitchers or bottles with waterfall waters. These are great keepsakes and help you seek cure from longstanding medical conditions. Do you dream of taking a plunge from a cliff into a fast flowing waterfall, just like those stunt experts? 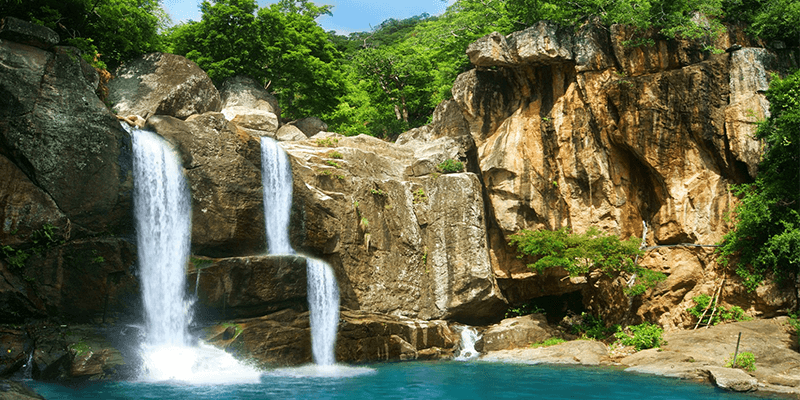 Well, your dreams would be realized at Shenbaga Devi falls. Plunging into the waterfall, from a height of 3 meter height, is a popular activity at this waterfall. But that is not the sole reason to visit the Shenbaga Devi waterfall. The shores of this waterfall are lined with the fragrant Champak trees giving it a fragrant ambience. The Chitraruvi forest area acts as an ideal backdrop for this waterfall. There is also the sacred temple of goddess Shenbaga, which provides the waterfall with its name. For a comfortable (and safe) bathing experience position yourself under one of the many rocks. You will find the speed of water perfect for your tastes. Tip: Not all places under the waterfall are safe for bathing, so take local counsel before taking a refreshing shower! With a short hike from the Shenbaga Devi waterfall you will reach this horseshoe shaped waterfall. Name of this waterfall is derived from two Tamil words – “Then” meaning honey and “Aruvi” meaning waterfalls. So, that leads us to the connection between the Thenaruvi falls and honey. You can find plenty of honeycombs on the rocks near this waterfall. Even the water at this waterfall tastes extraordinarily sweet! So, tasting the water is a must while visiting Theraruvi waterfalls. There are not one but three waterfalls that form a picturesque pool below. As for bathing here, the water here is very cool, some tourists have described their bathing experience as “plunging into a cold Jacuzzi”! If you have already taken a bath, just sit on one of the rocks with your feet soaked in the water, you will find your feet and body re-energized for the trip ahead. Situated 8 KM away from the Peraruvi falls, Old Courtallam falls (also known as Pazhaya Aruvi) is the oldest waterfall in Courtallam (as evident in the name) but it is also the least crowded. Bathing in this waterfall gives you a unique and relaxing experience. The rocks under the waterfall were cut into steps to curb the rapid flow of water, but this has served another purpose. If you are able to position yourself properly, the flowing water would give you a relaxing back massage! Apart from the massage, Old Courtallam falls are kids and senior citizen’s friendly. So, if you want some family time in the water, then this is the best place. 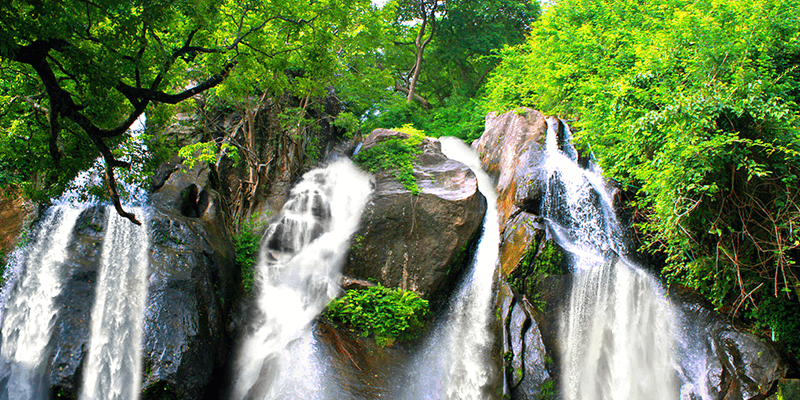 After the refreshing bath, do care to check out the popular Lord Murugan temple on the shores of this waterfall. Tip: There are different bathing areas for the adults and the kids. It is not often that you come across five different waterfalls from a single vantage point! Well that is what the Five Falls in Courtallam helps you experience. Also known as ‘Ainth Aruvi’ (in local language), this waterfall gets its name from the five cascading falls that meet at a place creating a pool of water. It is also compared to five headed cobra and hence highly revered by the locals. There are plenty of things to do around the Five Falls. You can visit the temples of Swami Ayyappa and Vinayaka or you can spend some time at the nearby eco-park. With their healing waters Courtallam’s famous waterfalls send you in a state of stupor after a nice oil bath under the sun with the water over head. So, the next time you visit Tamil Nadu, do care to check out this land of waterfalls. Previous articleHow to spend some days in Jagdalpur?